I believe that serendipity plays a big part in our lives, we just need to trust the universe and our own inner gut feeling for the right things to come along. The secret is to grab the opportunity with both hands when it presents itself. When someone I have been quite curious about arrived in London in July – hello Alexis Smart – I was ready to jump through hoops to meet her in person and lady luck was generous! On a grey & rainy Saturday in July, right after I went to a Glossier pop-up & came out wondering what the fuss & hype were about, I walked to Home House, my cosy abode for the afternoon. I got a text from Alexis that her taxi driver were a bit delayed, but she was on the way. When a beautifully ethereal woman with long, flowing blonde hair, somehow reminding me of a modern version of Genevieve, came into the lounge room, I knew immediately that I was in for a big treat of insightful conversation & I was right! Alexis warmly greeted me, we ordered some drinks & food to sustain us & started talking. Hours went by & the conversation flowed as if Alexis was a long-lost friend of mine. Calm, inquisitive & very intriguing. Now, a few months after our original meeting & two bottles of her tinctures already consumed & two more arriving, I am ready to share my conversation with Alexis with you, as well as my experience with the flower remedy tinctures that she creates – some of them you can order from her website in the US, some are stocked in the UK by Naturissimo & Amelia Nour & some she makes especially for her clients after the initial, 1,5 hour-long consultation in person or via Skype. Alexis, whose mum is half-Irish, half-English, was raised in the city of Angels, the infamous LA. Her mother was very much into healing modalities, treating Alexis with herbal teas when she was unwell as a child, but Alexis only became interested in the healing practises in her late 20s, when she encountered health issues of her own, including anxiety, which could hold her in its tight grip without warning, whether she was at home or driving. She also caught some nasty bugs on her trip to Egypt – malaria & stomach parasites aren’t pleasant to say the least. One day Alexis wondered into a store in West Hollywood, where she saw Dr. Bach Flower Remedies on sale, which surprisingly didn’t have clear user instructions on them. A regal looking woman working in the store caught Alexis’s eye and beckoned Alexis towards her, asking her to come back in ten minutes. Something about the situation that Alexis found herself in just felt right, so she left, only to return shortly after, curious. The woman gave Alexis some tinctures, with clear instructions on the label, as well as the brochure – there were seven remedies in one bottle & interestingly enough, the remedy that Alexis made for me on the day we met also had seven remedies in one bottle, but more on this later. Alexis’s own tinctures had remedies corresponding to her personality, which the woman clearly ‘clocked’ from just looking at Alexis in the way that Alexis initially couldn’t understand – for example, her remedy din’t have anything for anxiety, but had one for obsession with imperfections. Alexis went home & started taking the tincture. In three days she felt better, in three weeks she noticed that her behaviour was changing. Within a short time Alexis quit modelling & acting ( ‘it was a job, not a passion’) & parted ways with her modelling & acting agent for good. New prospects were beckoning & a inquisitive obsession with flower remedies developed. All of this took Alexis by surprise, as while she was interested in healing from the early age, observing her mother, not in a million years she considered it to be HER vocation. Looking back Alexis says that modelling & acting can lead to a critical state, where you lose confidence & feel disconnected from yourself. When you are disbalanced, your choices seem more like a reaction to emergencies, so when you start acting from the place of knowing, it just feels right. Years of cleanses, yoga, reiki & therapy didn’t bring Alexis such transforming results like the flower tinctures did – and through her work with Dr Bach’s remedies continue to do so. Within weeks, Alexis noticed a marked improvement in her health, making decisions became second nature, when before she was indecisive. Remedies addressed her emotional imbalances, so she started living based on the higher dictates of her soul & spirit, which never fail you, if you take time to pay attention to your intuition & inner voice. Alexis bought Dr. Bach 38 Remedies Kit & started experimenting with it, while training. Within five years from the moment that she first tried Bach flower tinctures, Alexis was treating her own clients one-to-one. Her own practise has been evolving since 2004, with studies from descendants of Dr. Edward Bach, as well as homeopathy in England & Greece, under George Vithoulkas. The regal looking lady stayed in Alexis’s life for five years, mentoring her, helping her interpret things that some of the more complex clients presented with. As the whole process evolved, Alexis came to understand how simple in its essence Dr Bach system was & to this day she refuses to complicate things. ‘Heal yourself’ is a simple principle in itself Alexis told me & in her opinion every family should have a Dr. Bach Flower Remedy Kit of their own at home, with which you can easily change your mood & help your body when it is hyper or tired or is under par, adults & kids included. The best way to know each remedy & its effect on a person was to try it, as well as get customer feedback. Everyone is individual, so while often there is a common thread with each remedy, in some cases Alexis noted unexpected results. She has a thoughtful & pragmatic disposition, so for her to use something on her clients, she needs to know that it actually works. When she sees her clients her approach is individual at every session, be it in person or via Skype & it doesn’t matter if you are a man or a woman or a child (she does have more female, than male clients, the latter at times reluctantly, are brought in by their other halves ) – we all have our little quirks, don’t we? At the end of the day, as Alexis thoughtful pointed out ‘we all are trying to be better & are working on ourselves each day’. Some just do it more consciously, while others prefer to ignore the warning signs, before change is forced on them by their own bodies. A consultation with Alexis takes an hour to an hour-and-a-half & feels a like a warm, non-contact embrace. She talks to you, asking unobtrussive questions like an old friend. How do you feel? Do you sleep well? Why did you choose to consult her? What troubles you? Do you cry easily? Are you easily rattled? More often than not people come to see her spurred by a health or emotional crisis, often brought in by prolonged exposure to stress & a strong feeling that they need some support. With time the sense of emergency subsides & clients come to see Alexis for regular maintenance. As you talk, Alexis looks at you, her mind deep in thought, occasionally taking notes or dropping in another sub-question. She clearly recognises & decodes you, matching you expertly to the remedy. She might also consult a list of remedies, if she isn’t sure that this or that would be a better ‘match’ for you, before she prepares your own tincture. One remedy is most effective, but in some cases, Alexis mixes up to seven into a navy glass bottle with a black pipette for you to take home with you. If you start with five or seven flower remedies and use it for a year, within 12 months you might come down to needing just one. When it comes to the actual tinctures, Alexis creates them according to original instructions from Dr. Bach and uses alcohol as preservative, in her case bio-dynamic brandy, and vegetarian glycerin in tinctures for the children. You should take four drops, four times a day directly under the tongue. When I asked Alexis about that protocol, she replied that ‘the dosage amount and sublingual dosing are all laid out by Dr. Bach, who originated this healing method, so I follow it. I know sublingual dosing bypasses the digestive system and absorbs immediately, as the tissue under the tongue absorbs quickly whatever you administer there, hence the reason they give B12 sublingually, as well as certain drugs. They seem more powerful when taken directly under the tongue, but they are still effective in a water bottle. I just seem to notice it more under the tongue, but it is a personal choice’. I would also like to remind you that four drops is one dose, if you put eight or more drops into a bottle, you might think that you got yourself covered for the day, but in actual fact you haven’t. Four doses four times a day, not one in a huge bottle that you sip during the day’. Even though Alexis’s business is growing, she does most of the work herself & her dad, a former graphic designer, who lives close by, assists her when the need arrises. Alexis also has an assistant, who helps with orders, dispatches & booking schedule. Alexis also believes in working in an environment that is conductive to her work & makes sure that her products are based not just on theoretical principles, but practical experiences of her clients, past & present. That’s one of the reasons why she occasionally does random trials, like the one she did a few months ago via Facebook, sending people an ‘Empathy tincture’ and then collating the feedback after a month-long trial period. When you take her tinctures – and I am still utterly fascinated, several months after initially using them, you will feel a little different in three days, but you should notice changes on a more profound scale in 21 days. But more on this a little later. When Alexis started describing my personality – and you have to remember, when we met, it was for the first time in person & we don’t have friends in common that know both of us well – she was spot on about many of my traits. She told me that I had a strong personality, am quick thinking & speedy to make decisions, as well as form opinions. When I get angry my anger is reactive & driven by adrenals (it also supposedly explains why I love bread !). I am also enthusiastic, curious (ok, website name could be a giveaway) & passionate, so much so that I will fight peacefully, but with determination for the cause or causes I believe in. I was mesmerised listening to Alexis’s descriptions of myself, but also was deep in thought about points that she raised, some of which I never contemplated or addressed. The remedy that Alexis created for me could have been based on one or two remedies, but instead we started with a ‘tower’ of seven blocks. Impatiens, Verveine (teaches you to just be, instead of doing something all the time), Vine (not often given, helps to be softer & less controlling), White Chestnut (goodbye overactive mind & questioning of ‘what if’), Star of Bleinhem (addresses past grief & brings you back to wholeness), Chestnut Bud (helps to stop acting in pre-set patterns & not learning lessons – this one is a very adult remedy), Willow (helps to be at peace when the world doesn’t seem fair or actions of others feel unjust).It was quite intriguing to see Alexis get her flower remedies kit out and make me two bottles of tincture, while sitting in the upstairs lounge of the Home House. Alexis asked for some spring water & just got on with mixing & writing labels for me. She also taught me a wonderful lesson of not just practising daily gratitude (which I have been doing for over a year now, focussing on everything that I have, rather the things that I lack or want), but saying ‘thank you’ even before good things happen. For no obvious reason. In retrospect, I think such mindset puts you in a kinder, more receptive frame of mind & leads to a happier sense of self & a more abundant creative flow. No wonder Alexis has such calm air around her, an invisible but palpable aura of assured sense of purpose & contentment. During our chat she said that she came to England feeling open to things & potentially willing to stay for longer, if it felt right, than her initial plan….. When you try your custom-made or general Alexis Smart remedies, remind yourself that change is coming. Alexis warned me that I might feel more tired, yawn, be more emotional or sleepy initially and that’s exactly how I felt during the first 24hrs of taking the remedy. I was much quieter upon my return home & continued to be so for a couple of days, almost weighing the words, before they escaped from my tongue. Your body is a machine and it takes time for it to re-boot, hence it is one of the reasons why Alexis recommends at least a two-hour window between taking the tincture, but if one window is longer and the other is shorter, it is fine too. Ultimately the ‘secret’ to success is to take the the remedy regularly & not sporadically. As I continued to take the tincture through the summer I felt calmer & more reflective. Less judgemental of myself & less inclined to pass judgement on others. I backed off watching television, so much so my husband at some stage asked me, if I was feeling alright (I was, but all of a sudden I preferred to read the news, rather than watch them on TV). The same applied to the movies & shows I normally watch abundantly – I became even more selective. I caught up on my huge mountain of books (it is still large, but instead of watching TV, I make sure I read more than I have done lately & those books don’t relate to my work). I finally committed to re-designing my website, as I dizzered about it for at least a year. Do I stay with my current team, with whom I have been since my website launch in 2008 or do I look for the new team? Well, the dye has been cast & the newly re-designed website is in active development. I definitely attribute making this decision to the powers of Alexis’s tincture. I became more conscious about what I want to achieve professionally & better at selecting people & brands that I work with. All this & much more in a space of less than three months – I can’t wait to continue with this journey. 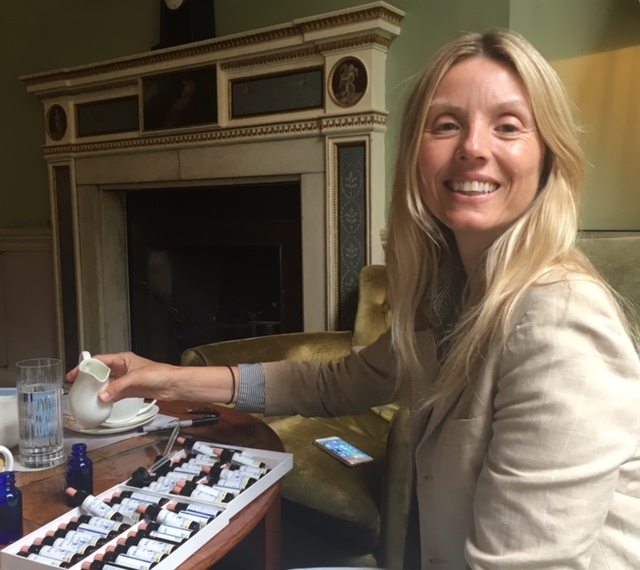 Before I round off that post, I also want to say that Alexis has Confidence tinctures, notably her Beauty Formula No.8 & the recently added Gamine one, aimed at teens & young women & men that are having self-esteem issues with their skin & bodies. There are Focus tinctures ( how about a Personal Assistant ? ), Heart Tinctures, to deal with, you guessed it, affaires of the heart, as well as Calm ones (the name of Peaceful Worrier makes me giggle every time I see the bottle). She also has multiple tinctures for kids, like Smarty Plants for a boost of confidence or a Dream Boat, when the little one struggles to sleep in his bed & wonders with sheepish determination into yours every night.